Pollo Guisado. I have to take a moment and let that dish sink in. Pollo Guisado. I’ve shared a bunch of recipes here on my blog and on my YouTube channel, but this recipe is one of the most special simply because it reminds me of home. It’s the dish that takes me back time and time again to my childhood in Queens, NY. I remember coming from school smelling the Pollo Guisado from outside of the house. If you’ve never had this dish just now that it smells divine. It’s heavenly. What’s best is that the trick to making this braised stew chicken is to get the oil really REALLY hot. The sizzle it makes when you’re browning the chicken is unreal. As a kid, I remember watching my aunt making this dish and being worried that the oil would pop and hurt us both since I was right there next to her learning how to cook. Years later, it’s my turn to make this dish and I crank up the fire just as high to get the oil just as hot. I had this dish at least once a week; it was a staple in my house. We usually had it with rice and beans but my favorite way to have it with boiled green plantains. Pollo Guisado leftovers were a treat since the sauce had a chance to settle and the meat was forever tender—never dry. No two Pollo Guisados taste the same since every family has its own sabor. 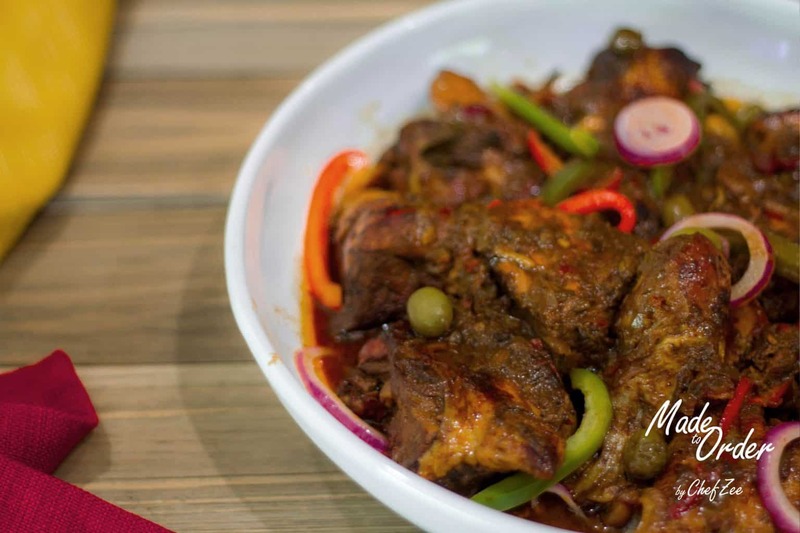 In fact, Pollo Guisado is a popular dish all throughout the Caribbean. It’s fun and interesting to see such a traditional dish evolve island to island. Today, I’m sharing my version, which I hope you enjoy.